Kotozuka, Eiichi (1906-) "Kyokochi Pond (Kinkakuji Temple)" - Watercolour - Chinese and Japanese woodblock prints for sale, silkscreen, scrolls, watercolor, lithographs. Artwork Details for Kotozuka, Eiichi (1906-) "Kyokochi Pond (Kinkakuji Temple)"
Any long thin horizontal or vertical colour streaks in the image are due to the scanner. Notes: This is an obviously rare (one of a kind) watercolour base sketch ("genga") for the corresponding woodblock print that you can find elsewhere in my collection. Uchida's intention was to issue this scene as woodblock prints mounted to scrolls. 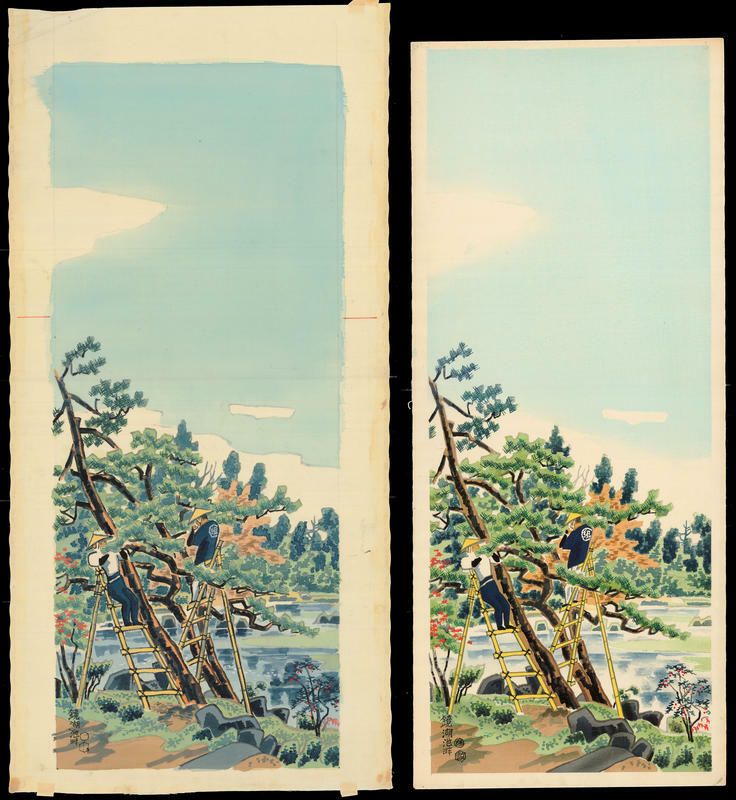 In the end Uchida published this scene as double-oban-sized woodblock prints for framing (although they are also very rarely seen). Note the red lines where the scene was truncated to double-oban size.